A 5 on the left (after John Coates drawing) and a 3 on th eright - mainly after Olympias. Hat figures to show scale. 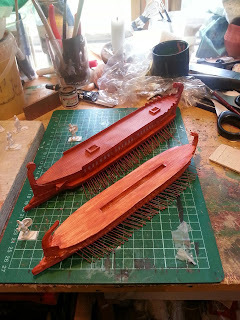 The whole models have a couple of coats of wood-glue mixed with acrylic paint to seal the card and polystyrene they are made of. 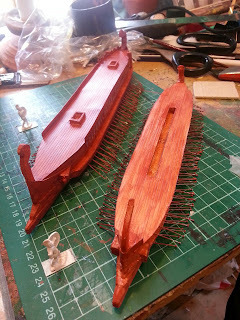 The pins have a coat of the same butmay also need metal primer paint. 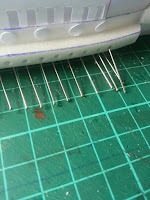 The ends of the pins will be masked by plaster splash waves on the model's base-I could not face clipping so many off!. I may try with pushing the head in first so the points are out, but hundreds of points are also dangerous... Maybe the points can then be speared with some claggy stuff to be painted white as splash ? The ships need oars. Many oars. At this scale a composite thing such as printed paper or scored plastic will not do..unfortunately. 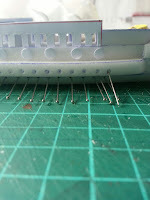 I tried plastic bristles but they were too thick, Various wires but too thick or they bent. 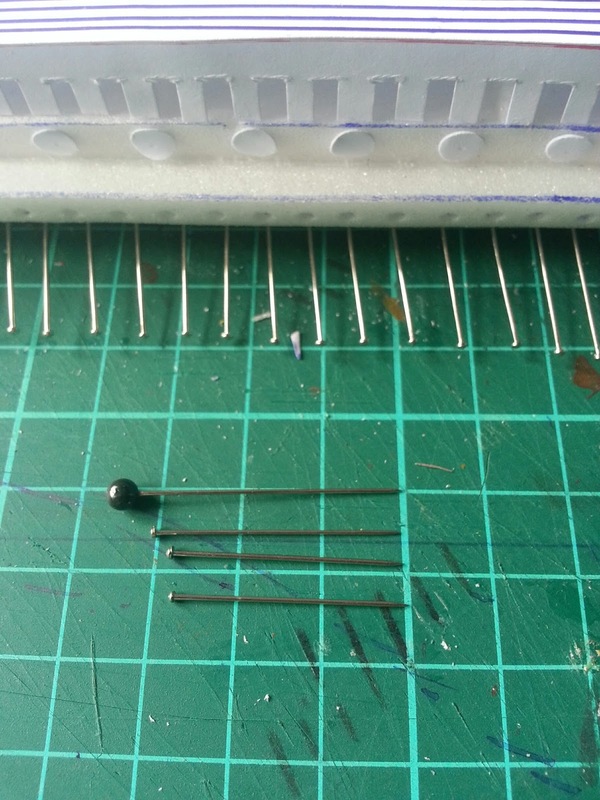 The solution is dress-making pins. A trip to a haberdasher revealed more types of pin than I had imagined. So I got 28 30 and 38mm pins, And some funny looks. I tried to think of excuses but luckily there was no conversation and I escaped with the suspicion of eccentrism not being quite confirmed. 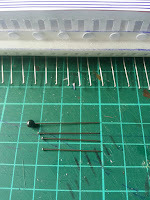 Pins are fine enough to look good for N-gauge ( I like that: N-gauge ships !) and they are rigid enough to survive some handling. 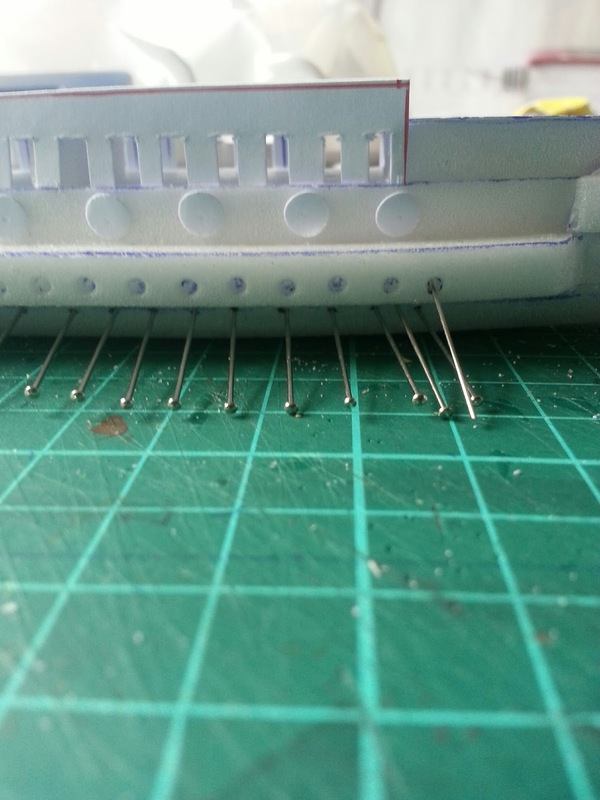 The pins are secured by shoving them in and even though it takes a while the impression of mass and complexity is fabulous. Looking at so many 'oars. '- even though it's a model, gives a great impression of the mass of humanity and wood combined with intelligent organisation required to make a galley function. Anyway .. onward. 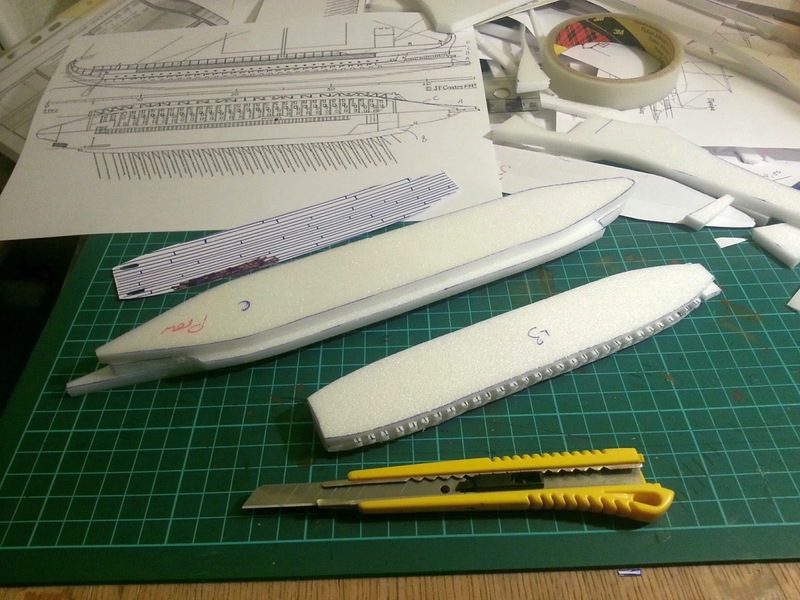 3x170 or so to go,,,,,,and of course, if a ship modeller pricks his finger with an oar he will sleep for 100 years, so beware. 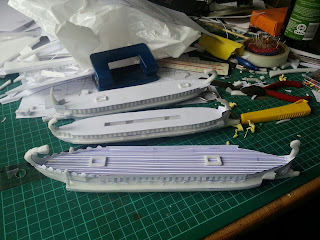 Now looking more like ships..
A 5 and two 3s. Next step is the oar problem. Pins or wire or plastic bristles ? 5 and 3 under construction at 1/160 scale. Lots of trial and error ..but I'll show the results soon.